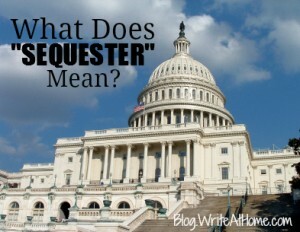 Home / Blog / What Does “Sequester” Mean? I don’t talk politics here. Don’t let that fool you into thinking I don’t care about politics; I just try to keep it out of the WriteAtHome Blog. And I don’t plan to offer any opinions (though I’ve got them) on sequestration. I want to talk about the word itself. Turn on the radio or TV these days and it won’t be long before you hear about the looming sequester or sequestration. You can probably figure out what they mean by context, but I’ve wondered for some time why they keep using this word. To sequester means to hide away or set aside. Juries sequester themselves when they deliberate on a trial. That’s the most common meaning of the word. And I guess you can understand the current talk about a federal budget sequester in terms of “hiding money away.” But that’s an odd way of thinking about it. A not very helpful way, if you ask me. But sequester has its own definition in the world of politics and economics. It means an across-the-board budget cut. A reduction that applies to all areas rather than a specified few. These days, it means the entire Department of Defense, for example, will face a broad cut in funding. Although a cut, according to politicians, can mean simply reducing how much a budget was going to increase. A nifty sleight-of-hand, but I’m getting way too close to giving away an opinion here. Back to the word. Sequester is the typical verb form. It’s a transitive verb — you sequester something. The noun form is typically sequestration, but that’s a bit of a mouthful for people, so it’s become customary to use sequester as a noun too: the President hopes to avoid the coming sequester. So why has this obscure word suddenly come into prominence? Have we never faced an across-the-board cut before? Well, not often, and it hasn’t been much of a controversy, I guess, in the past. But perhaps the very vagueness and obscurity of the word makes it useful to politicians who can give it an ominous feel. Oops, there I go again. Comments? Questions? Please leave them below. Please Quit Starting Papers with Dictionary Definitions! Spelling Nazi Alert: Isn’t it “sleight-of-hand”? Of course it is (hangs head in shame). Maybe there should be some cuts in the salaries and health care coverages of our members of Congress.